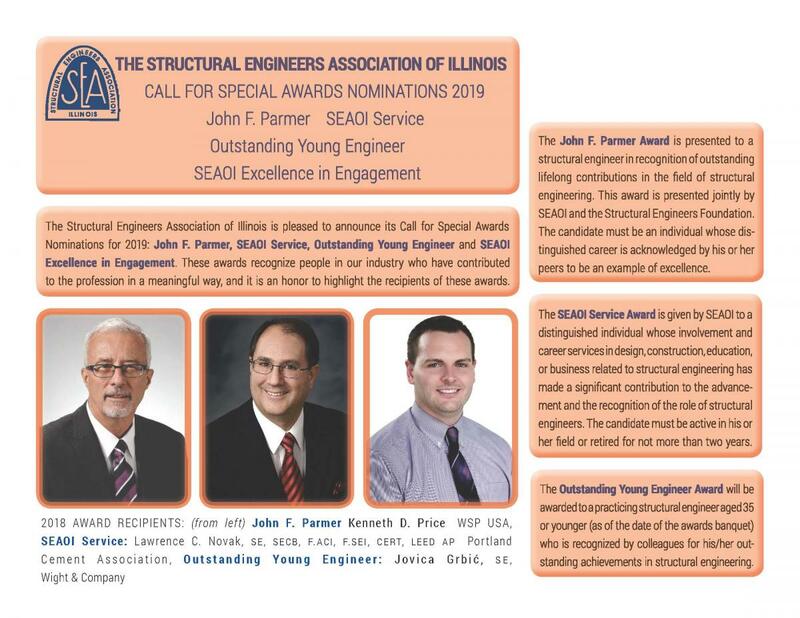 The late John F. Parmer, a founder of SEAOI and its first Executive Director, believed structural engineers should be recognized for their important role in creating our constructed environment. The John F. Parmer Award is presented to a structural engineer in recognition of outstanding lifelong contributions in the field of structural engineering. This award is presented jointly by SEAOI and the Structural Engineers Foundation. The candidate must be an individual whose distinguished career is acknowledged by his or her peers to be an example of excellence. John F. Parmer, a structural engineer, was one of the seven founders of SEAOI. In 1965 he, along with Frank Wells and Ken Naslund, came to talk to Nissim Eskenazi and George Ellis about starting a structural engineers association in Illinois. They were joined by Henry Miller and Frank Cooper. Within a very short period of time, SEAOI was founded. John F. Parmer became the first executive director and he, as well as his wife Chris, spent many hours working for SEAOI at 173 W. Madison Street in Chicago. In the spring of 1977, at age 88, Mr. Parmer’s health began to fail and he found it necessary to retire from SEAOI. In June of that year, SEAOI presented him with an award, the first John F. Parmer Award, for service to the profession. When Mr. Parmer passed away in the fall of 1977, his son, John C. Parmer, and daughter-in-law, Carolyn Noonan Parmer, wanted to remember him by doing something special, on his behalf, for structural engineers. Therefore, in his honor, they presented SEAOI with a check for $500.00 to fund a John F. Parmer Award, honoring a structural engineer whose distinguished career was acknowledged by their peers to be an example of excellence. John C. Parmer passed away in September, 2005. His family continues to support the John F. Parmer Award as they have done for more than 30 years. Both SEAOI and the Structural Engineers Foundation gratefully acknowledge the Parmer family’s longstanding support of the structural engineering profession. 1995 Clyde N. Baker, Jr.